… and his friends. And his adversaries. At least so far as the Archie Comics universe is concerned. 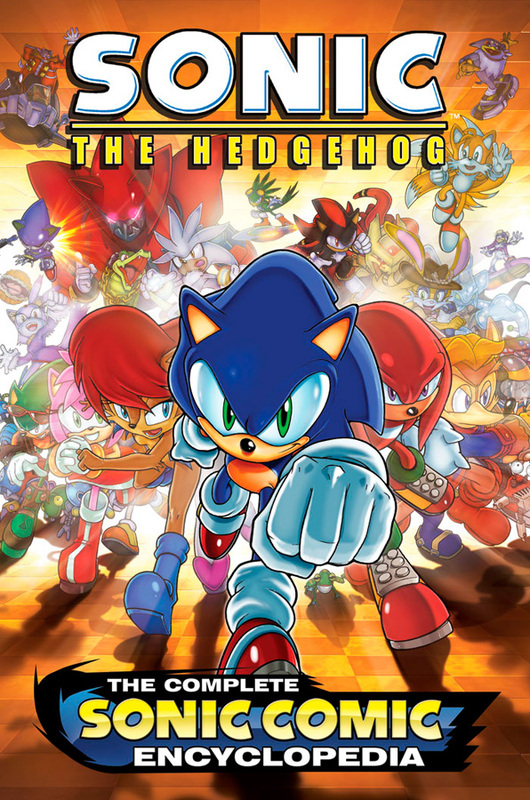 The Sonic the Hedgehog Who’s Who is a project that has been in the works since 2010, and put on hiatus several times as Sega Games decided to become involved. Now Archie Comics have announced that the newly-named Sonic the Hedgehog: The Complete Comic Encyclopedia will be released as a full-color trade paperback this October. “For the Sonic fan on the go and those who want to know it like the pros, this is the long-awaited official source for Sonic the Hedgehog comic info! Includes new, exclusive information not yet revealed in the comic itself and packed with entertaining character and locations listings that definitely explain Sonic’s world, Mobius. It’s a big place that has been featured in hundreds of issues of stories – the longest running video-game inspired hit comic ever!” Written and edited by Ian Flynn, it features art by Patrick “Spaz” Spaziante and several others.